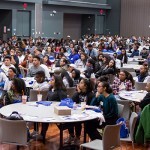 Photo: David Schmitz High school students from Santa Clara County schools listen to speakers in the Diaz Compean Student Ballroom at the African American College Readiness Summit. 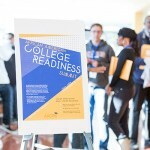 Photo: David Schmitz Students check in for the summit. 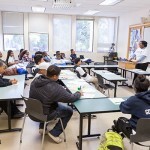 Photo: David Schmitz Students listen to SJSU alumni and community members about their journey through higher education. Photo: David Schmitz SJSU volunteers energize the crowd with dancing. Photo: David Schmitz Students visit the Smith and Carlos sculpture during a campus tour. 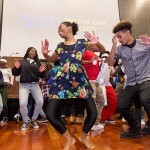 On Nov. 18, San Jose State University hosted nearly 500 high school students from 34 high schools in Santa Clara County at the African American College Readiness Summit. The high school students gathered at SJSU early Friday morning for a welcome and keynote speech from Dr. Anthony T. Browder, an author and cultural historian whose research is focused on the excavation and restoration of two 25th dynasty tombs of Kushite noblemen in Egypt. 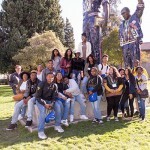 Throughout the day, the high school students heard from current Spartans about their educational journey, SJSU alumni, faculty and community members. All volunteers imparted tips for preparing to apply for college as well as advice on how to be successful once accepted to a university.